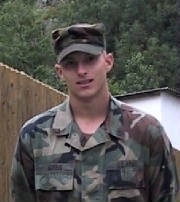 This email and the photos on this page are from a (now retired) soldier who served with Daniel in Germany the beginning of Daniel's Army career. My name is Raleigh Koch and I am writing about Daniel Morris. I was informed today that Daniel was killed in Diyal in 2006. I wish that I had known earlier. I heard the news from a soldier who was in our crew back then…a Bradley fighting vehicle has three crew members, and if it's a good crew, they are all pretty close. I was Daniel's squad leader and Bradley commander when he first came in the army. His first job was as my driver and we had a few adventures together. 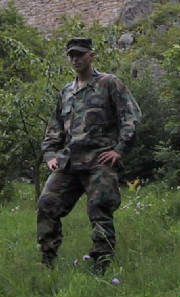 He and I deployed to Tabor Falva range in Hungary in May 2001 for a readiness exercise. 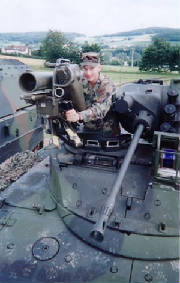 We also took part in a German-American partnership event in Oberviechtach, Germany in July, 2001, where we took our Bradley fighting vehicle to a static display event and mutual training with the German Army. 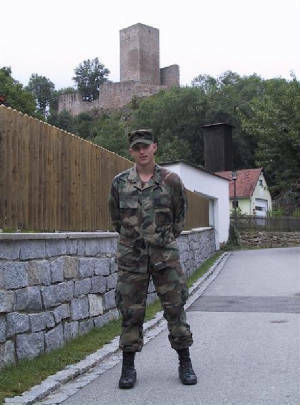 I have enclosed a picture of Daniel in front of old Wolfsburg castle in Oberviechtach, taken on 20 July, 2001 (we did a little hiking while we were on the training mission there). 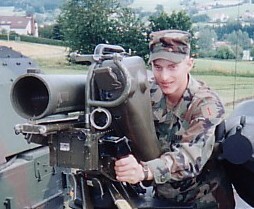 I'm also sending sending a couple pictures of Daniel at the display we participated in at Oberviechtach in 2001. The picture of Daniel behind a weapon system was a German armored personnel carrier (Marder). Sadly, that’s all the photos I’ve got of Daniel. Like all amateur photographers, I always look back and wished I had taken more. 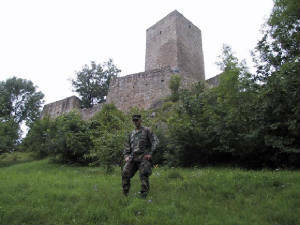 Daniel and I worked very closely on two missions together, the Oberviechtach event and an MRE to Tabor Falva, Hungary. I wish that I had some pictures of Daniel on the Hungary mission. We worked some long hard hours on that one, and Daniel was absolutely indispensable to me. It’s been too long ago, I can’t recall why I didn’t take a camera, perhaps they were not allowed. That illustrates why one must remember carefully, photos aren’t everything. Daniel really enjoyed working with the German soldiers, and they were impressed with his knowledge of equipment. Daniel was an extraordinary worker, if you didn't already know. If given a task, no matter how dirty or difficult, Daniel executed it immediately with absolutely no hesitation or discussion, a rare quality it today's soldiers. I imagine that he was a great leader, and would have been proud to have had him as one of my squad or section leaders. He was also a man of great humility, a quality almost impossible to find anywhere these days. My grandfather is the only other individual that possessed that quality of humility like Daniel, and it is an attribute that I admire. My grandfather served in the US Army for 36 years, was a POW for 3 ½ years and lost his only son in Korea and never lost his ability to appreciate his fellow man. It was the same quality that I saw in Daniel. I personally selected Daniel as my driver in 2000 as I had noticed what a serious and devoted young man he was, loyal to the army even though a young private. We had quite a few long talks and he told me he had found peace of mind through the Christian faith, something I respected very much. He was an honest, hard working, initiative taking soldier, always trying to improve. If he did something incorrectly, it was always inadvertently and never intentionally. His only bad habit was that he liked to drive his Bradley a little faster than I liked. Not much of a bad habit, actually. I was very sad to hear of his death and wish I had seen him in Iraq as our rotations overlapped some. I did not realize he was in OIF II or I might have been able to arrange to see him. In any event, I simply wish to convey my best wishes to his family, and his daughter, and to see if there is something I might be able to do in the way of helping commemorate him or help his daughter. I have thought of Daniel often, and will continue to do so. Please send his family my condolences. For reference, I retired from active duty 1 June 2008 here in Germany. I would also like to make one correction about Daniels first unit. It is listed as Baumholder. Daniels first unit was 3rd Platoon, C Company, 2nd BN, 2nd Infantry Regiment, 1st Infantry Division in Vilseck, Germany. It's not an important fact for his memorial, but it's important to me simply because I would have never known him if he had been in Baumholder. PS By the way, I served in Desert Storm with 1st CAV (2-5 CAV) and am a member of the 1st CAV society, so I have plenty of sympathetic connection with those guys. I might add that my step-father was also in 1st CAV during the conflict in Vietnam. My best wishes for all those First Teamers. and uncropped so you can see the beauty of the surroundings.